It aims to be the best way to customize and describe your roleplay interactions, by brining together the powerful customization features from Total RP 2, new features asked by our users and a much better user interface designed with usability in mind. 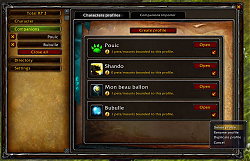 With this addon you can fully customize all the information about your characters and companion (pets, battle pets, etc. ), like the name, the description or even attach an image to represent them. Our goal is to bring back the simplicity and user-friendliness of add-ons like FlagRSP and MyRoleplay but without sacrificing your freedom when defining your roleplay characters. Total RP 3 implements the Mary Sue Protocol, which is also used by roleplay addons like MyRoleplay, XRP or even Total RP 2. 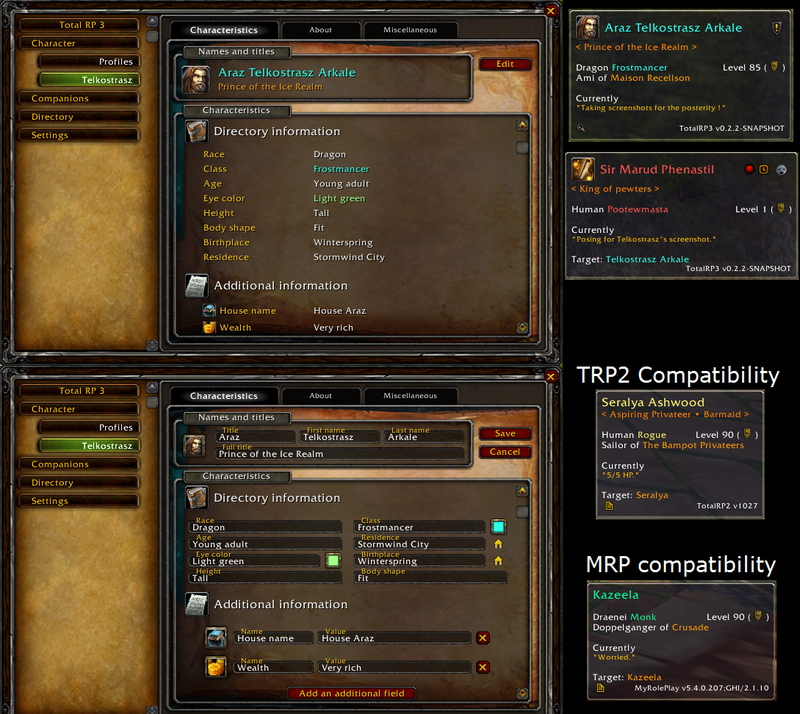 That means TRP3 can understand and exchange data with all these addons. Also Total RP 3 is a fully modular addon. So even if it will greatly expand in the future, you can choose exactly which features you want to use and won't be bothered by a complex user interface if you don't want to. This is the main module which will be required to run any future expansion. 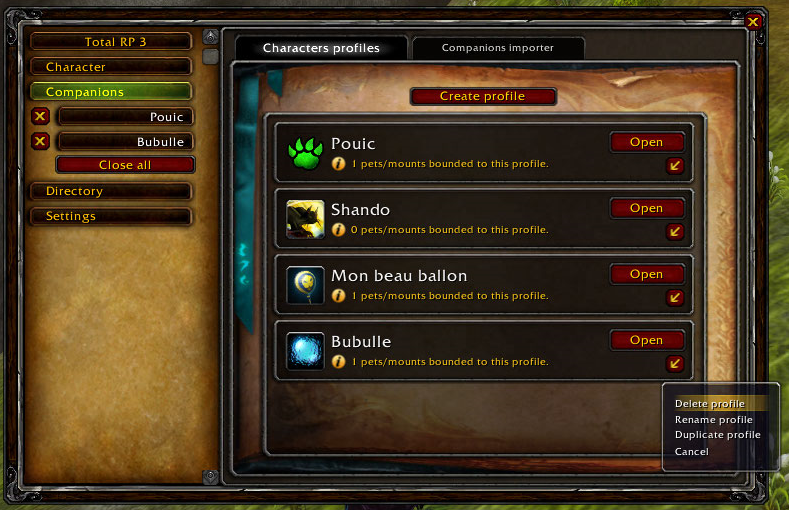 You can customize your characters and companions (battle pets, pets and mounts) with a powerful profile system. 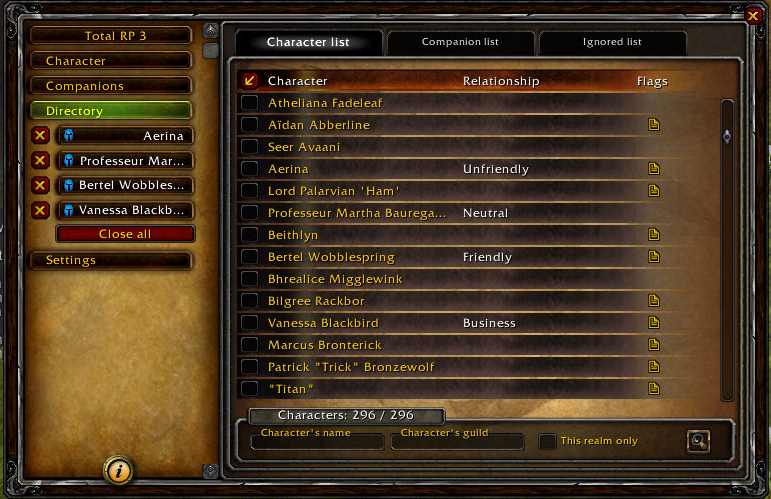 Keep track of all characters and companions you crossed by with the directory. Locate other role-players on the world map (requires Total RP 2 v.1.032 or later, or Total RP 3 v.1.0 or later). 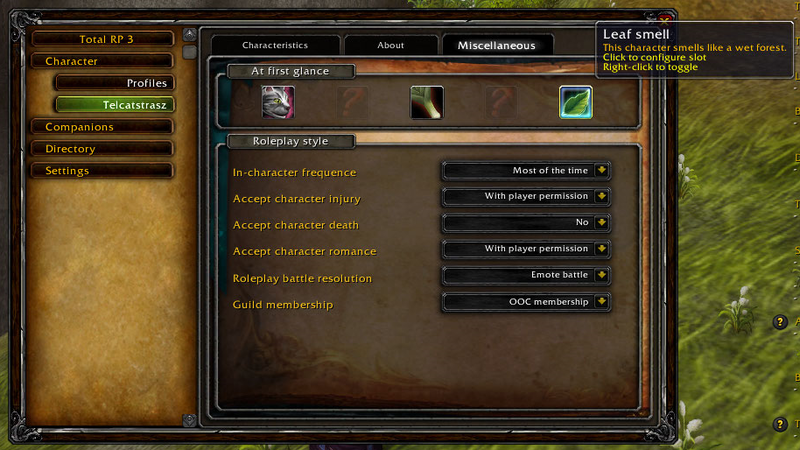 A customizable target frame, allowing you to easily reach useful actions about your roleplay target. Full Mary Sue Protocol implementation : Total RP 3 can communicate with MyRolePlay, XRP, Total RP 2 and other MSP add-ons so you can view other players information even if they are using another roleplaying add-on. Import your existing profiles from Total RP 2, MyRolePlay, XRP, flagRSP2 and flagRSP(MoP). - Added compatibility with the MSP protocol to share trial flag and music theme with other RP addons users. - Added new default icons for Kul Tirans and Zandalaris (sorry KT females, couldn't find a better icon). - Added 2 images, 36 musics and 46 icons from patch 8.1.5. 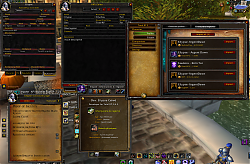 - Fixed an issue with map scans tooltips not working properly. - Fixed a bug occuring when scrolling down the music list if it passed over specific invalid musics. - Fixed an issue that would stop displaying a profile using template 3 halfway through. - Fixed an issue that would create duplicate profiles in the directory. - Fixed an issue that would not reload a profile coming from MSP properly after deleting it from the register. - Added 562 icons, 51 images and 56 musics to Total RP 3's resources browsers for patch 8.1. - Fixed a Lua error that could sometimes appear when trying to request data from one of your Battle.net friends while your Battle.net status is set to appear offline. - Fixed invalid game version check on login. We cannot properly check the game build number in the current 8.1 build. - Fixed an issue that would make users still send their map location when the option to not send it when your roleplaying status is set to "Out of character" was enabled and they were indeed "Out of character". - Fixed an issue that would prevent the `/trp3 roll` command to work properly when in a group or a raid. - Other players' characters information without a profile attached to them are now correctly purged on startup to avoid storing them indefinitely. - Profiles received from links are now correctly applied a "Last seen" timestamp so they are correctly treated by the automatic directory purge instead of being always deleted because of the lack of timestamp. - The add-on will now warn you with a different message than the regular one if you are several versions behind and are at risk of issues because of that. - The advanced settings would not get the user selected localization applied to their texts. - Fixed issues related to upcoming API changes in patch 8.1. You can now once again scan for Total RP 3 users on the world map. - Added support for War Mode. Players that are not in the same War Mode as you will not appear on the world map by default. - In the Location settings (Register settings tab) you can enable the option to show people who are in a different War Mode, they will appear greyed out and semi-transparent on the world map, and will be grouped separately when displayed in the tooltip. - You can opt in to not be visible to other players while you are in War Mode. 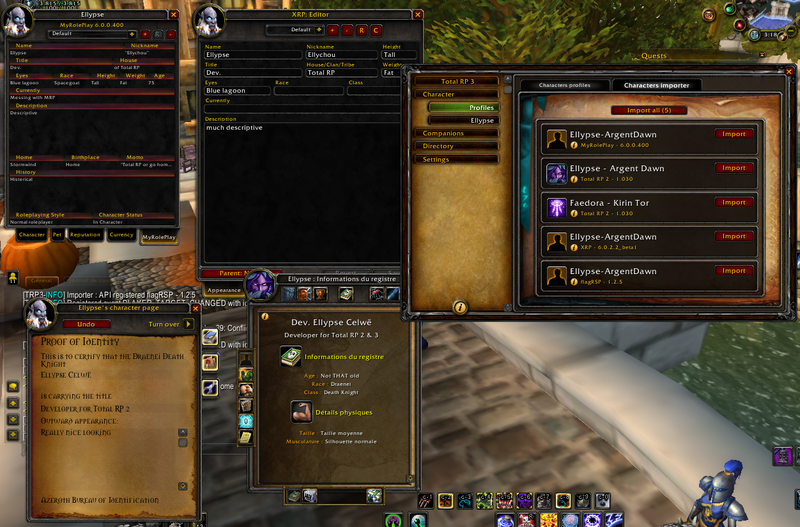 - Map scans now differentiate between levels of a same zone (like Dalaran), and setting your home to a specific level of map will now correctly show on that level when users click on the home button on your profile. Please note: Only players with Total RP 3 version 1.5.0 and above will show up. Total RP 3: Extended's scans will be updated to work with this new system. Since patch 8.0.1 you are able to report profiles that violate Blizzard's Terms of Service by opening a support ticket. 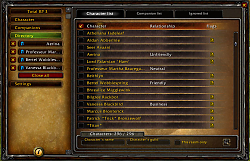 - Following Blizzard's guidance, you can now report a player who has a profile that goes against the Code of Conduct via Total RP 3's target frame. 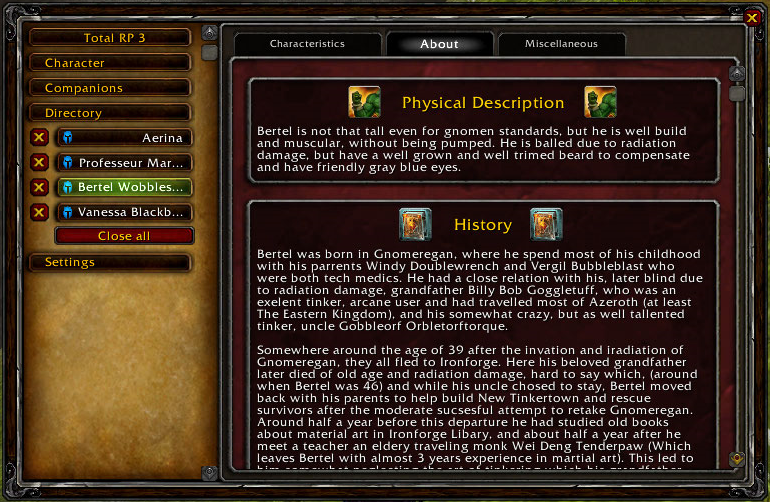 A standard game report window will open pre-filled with information about the player you are reporting. - Since it is not technically possible to report a player you cannot target, we have added a button to the profile page when opening a profile that opens up a link to a Blizzard support page on how to report add-on text. - Added a workaround against a current game bug that will always reset the language currently selected after a loading screen. You can disable this workaround in case of issues in the advanced settings. - Added a workaround to make sure Total RP 3's broadcast channel (xtensionxtooltip2) is always at the bottom of the channel list. This should fix issues where it would be the first channel and move all other channels you have joined down in the list. You can disable this workaround in case of issues in the advanced settings. Hi. There was an issue with the packaging of this specific release (I've been trying new methods to make sure the add-on is cross-posted to both Curse and Wowinterface, as I would often forgot to update on Wowinterface). The issue should be fixed in version 1.3.4beta4. Sorry about that. I loved MRP! I'm glad that they finally got the Mary Sue thing finished, looks good so far.